Dang Shen is the Pin Yin (Chinese) herb with the common nickname "Poor Man's Ginseng". This is because the actual Ginseng was too expensive for some, and the Dang Shen offered similar benefits without the high cost. As an energy tonic, Dang Shen ginseng is often used to increase one's qi, and as a result, one's immunity may be increased, leading to overall health. This variety of Ginseng is often used as an aid in weight loss and it works by increasing the metabolism and improving digestion, which can help change fat into muscle. Dang Shen, Codonopsis, has the similar but weaker efficacy compared to ginseng. It is thought to serve the whole body, boosting strength, increasing stamina and alertness, reducing stress and stimulating the appetite. It is also considered both a strengthener and an energizer and for targeting the spleen's function, it may allow one to overcome weakness, as well as fatigue and chronic diarrhea. 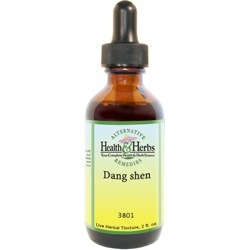 Dang Shen has also been used to strengthen the liver and stimulate bile. It is commonly known as a heart tonic and has been used to strengthen and tone the heart by helping it to vibrate in a steady, regular rhythm. Research has also shown that it increases red blood count and hemoglobin, and it is sometimes used for diabetes because it replenishes fluids. It may strengthen respiratory function and is often used for shortness of breath, and chronic cough. It is especially useful for asthma attacks. And since it is gentler than Panax Ginseng, it can be taken as a supplement more often with fewer side effects. Dang Shen has been used as an astringent in excessive uterine bleeding, and for rheumatic and other joint pain. As an adaptogen, Dang Shen is very useful for people who are easily overstimulated by Asian ginseng. It is has been used in protocols to treat people who have a chronic fatigue immune deficiency syndrome. The herb has a pleasant sweet taste to it, making it easy to tolerate. Pharmacological research has confirmed that the herb promotes digestion and metabolism, helps to strengthen the immune system, stimulates the nervous system, dilates peripheral blood vessels, and inhibits adrenal cortex activity, thereby lowering blood pressure. Compounds found in Dang Shen ginseng, retard the production of fibrin, forestalling blood clot formation. In those with chronic fatigue syndrome (CFS), this action can help to maintain normal blood pressure, and indirectly ensure the brain receives enough oxygen for normal functioning. Dang shen helps the body fight off invading pathogens that threaten the immune system. Adaptogens increase the body's general performance in ways that help the whole body resist disease. Dang shen tinctures have been found to be useful as an anti-aging herb that is helpful for a number of health problems, including assisting in immune function and improving brain function. It is an excellent herb for feelings of tiredness, chronic fatigue, stress and adrenal fatigue. Dang Shen/Codonopis is thought to benefit the entire body by boosting strength, increasing stamina and alertness, rejuvenating the body, aiding in the recovery from chronic illness, reducing stress and stimulating the appetite. It has been beneficial for the spleen, lungs, stomach, to raise the secretion of body fluids and blood sugar levels when needed. The herbal tincture has been shown to lower glucose levels in the blood that lessen the production of insulin. Insulin is the hormone that signals the body to store fat. This herb has been used in TCM as a gastroprotective agent. It has been found that when used in unison with Licorice and Aloe, it may be helpful for peptic and duodenal ulcers induced by stress or by over-consumption of aspirin and non-steroidal anti-inflammatory drugs. According to Traditional Chinese Medicine (TCM), the channels that Dang Shen acts on are the spleen and the lungs. The spleen is considered to be the transformer of the body; transforming food and fluids into qi and blood to nourish the entire body. If there is illness the spleen will be affected and its main function of transformation will be decreased leading to the overall lack of energy. Reduced energy can make it difficult for a body to overcome weakness, as well as a lack of appetite, loose bowels, and blood deficiency. Because it is a warming herb it is not always recommended for colds and other viral infections accompanied by fever. This is because these types of infections are called "warm, febrile disease." If there is fever, taking a warming herb can make the fever worse. Dang Shen is more appropriate for those who are weak in the lungs. Research has shown that asthma attacks may be less severe by employing this herb due to the ability to reduce the production of the hormones that constrict bronchial passages. The herbal tincture also aids dry coughs and other lung conditions, including a wheezing cough and a croupy cough. Some researchers theorize that Dang Shen may benefit patients undergoing AIDS treatment or chemotherapy, as it reduces the side effects of toxic drugs by increasing red and white blood cell counts. Chinese clinical studies show benefits for cancer patients treated with radiation therapy or chemotherapy by delaying the destruction of healthy cells. Because it is a warming herb it should not be taken if a person is already in excess of energy (extroverted, easily angered, high blood pressure). It is best used for those that have a weaker constitution and suffer from lack of energy and daily stresses. It is a great alternative to caffeine and caffeinated drinks. Ingredients: Ginseng Root-Dang Shen, Structured Water, 20% Alcohol. Non-Alcohol: Ginseng Root-Dang Shen, Structured Water, and Vegetable Glycerin. Contraindications: Hypoglycemics should use caution, as ginseng lowers blood sugar levels. Do not take if you have heart disease or high blood pressure.